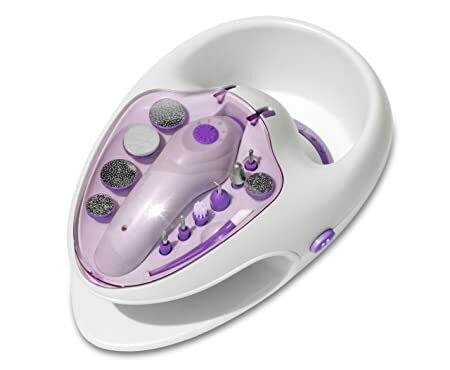 The Comfort Products Manicure/Pedicure System features a bubbling bath for preparing hands and nail dryer (fan). The manicure tool features right and left rotation, 2 speeds each direction, and 12 attachment manicure and pedicure tools. Rechargeable battery. Comfort Products develops, manufacturers, and markets targeted consumer products designed to improve and enhance the lives of consumers in a variety of applications. As the name implies, they put the “comfort” into daily life. With an emphasis on automotive, seating, and wellness products, Comfort Products has a long history dating back to 1919. For decades, the company has been a trailblazer in their product categories, and established long-standing relationships with their customers with loyal brand name followings such as Kool Kooshion, Relaxzen. Headquartered in Memphis, TN, America’s distribution capital, the company has distribution facilities in Olive Branch, MS and Mesquite, TX, and permanent offices in Asia. Their long company history and strategic business partners allow them to provide quality products at tremendous values. 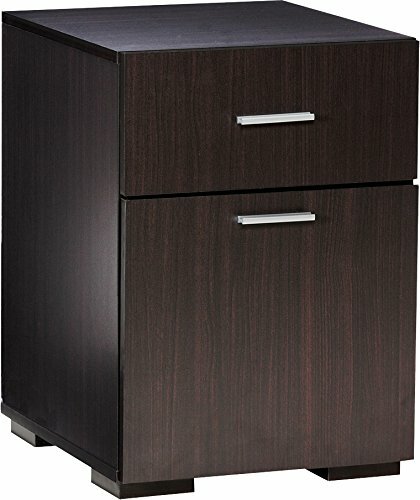 Add storage space to your home or office with the Comfort Products 50-2401 Modern 2 Drawer Lateral File Cabinet. The easy-to-assemble cabinet features a modern design constructed of engineered wood with wood grain paper laminate. Designed for flexibility, comfort and space, the two-drawer design and compact sizing stands alone or fits under tables and desks for added storage space. The included filing insert makes keeping track of your documents simple. Easy assembly requires 30 minutes or less to set up and use. The file cabinet is available in espresso, oak and walnut finishes to compliment your dcor. This assembly-required cabinet is packaged individually. 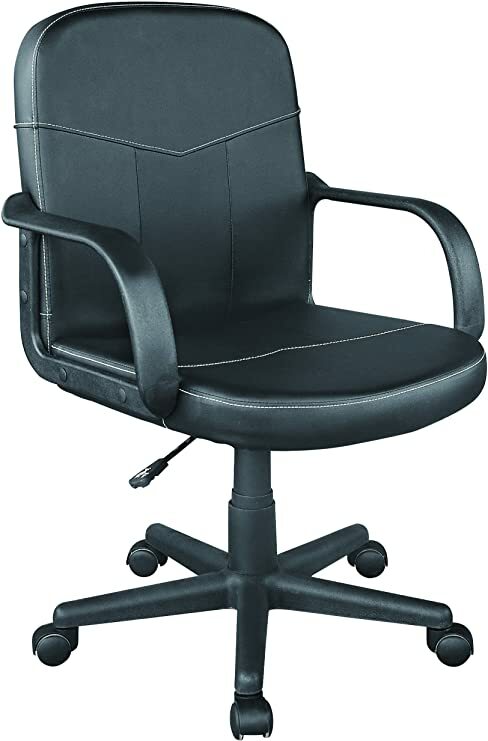 Soft bonded leather black upholstery, padded armrests and adjustable lumbar support make the Granton Executve chair a must have for any office or home office. Comfort is the focus of the Granton. Soft bonded leather upholstery is soothing to the touch and a welcoming feel during long periods of sitting. The adjustable lumbar support, a higlight feature of the Granton, adjusts to meet the amount of lumbar support needed in order to reduce slouching and provide an overall better sitting experience. With 2.5″ of padding on the armrests, the curved “waterfall” design armrests work to reduce shoulder tension and provide added comfort while working. Accented with gunmetal gray colored armrests and base, the Granton is sure to add style to any room. 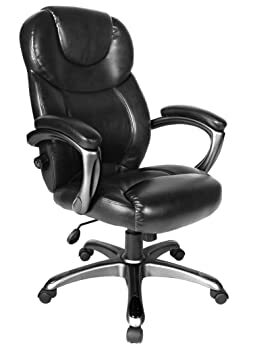 Pneumatic adjustable seat height allows you to choose the seat height (between 17″ and 20″ height) best suited for your size and sitting situation, tilt and tilt tension allow the chair tilt to be adjusted to the user’s preference and the swivel feature promotes maneuverability while sitting. Durability is a key component to the chair and is supported by a thick and durable nylon base with dual wheel casters which roll easily on most surfaces such as chair mats, linoleum, and short pile carpet. This chair meets or exceeds all BIFMA requirements and will support up to 250 lbs. With an extra-large seating area, a re-enforced gas lift, and an extra strong base and frame the Admiral III Big and Tall Chair by Comfort Products is designed and ready to stand up while you are sitting. This assembly-required chair is packaged individually. The easy-to-assemble chair is constructed of a heavy-duty chrome base and frame with black bonded leather upholstered foam padded seating. This 500-pound capacity chair features a large seating and back area with a durable seat cushion for a spacious and comfortable seating area. Pneumatic seat height adjust lowers and raises the chair as needed while the swivel feature increases maneuverability while sitting. The chair is supported by a thick and durable chrome base with dual wheel casters that roll easily on most surfaces such as chair mats, linoleum, and short pile carpet. 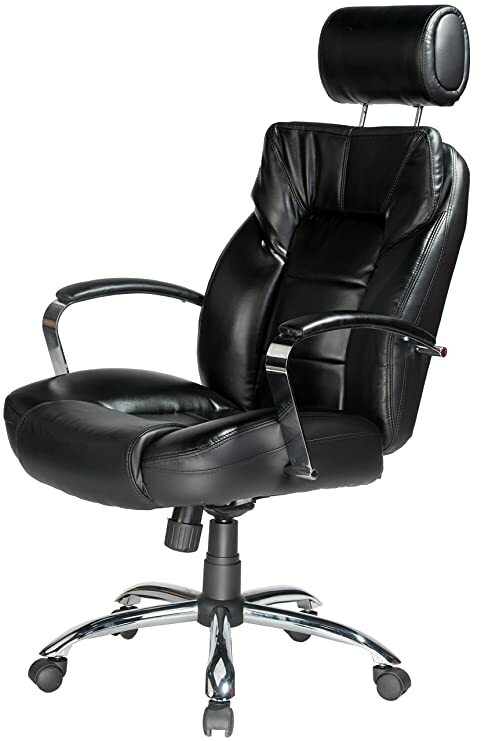 The Commodore II Oversize Executive Chair by Comfort Products supports up to 350 lbs. 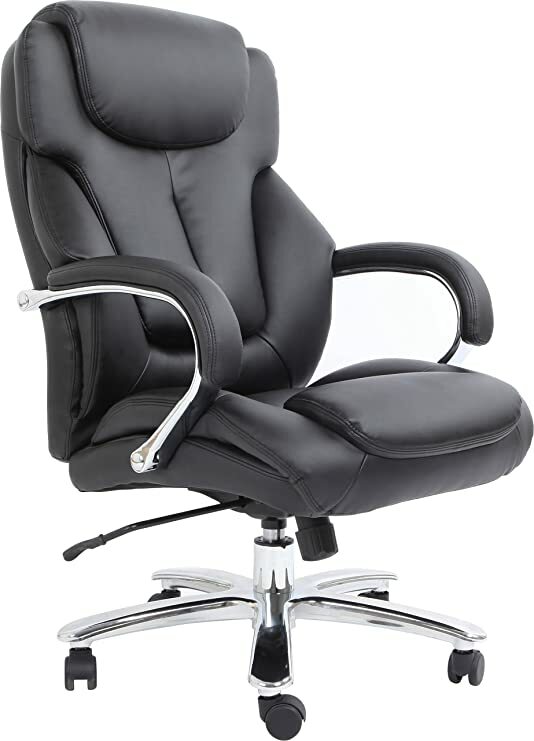 Featuring an adjustable headrest, chromed padded arms, metal chromed base, and tilt, tension, swivel, lock, seat height adjustment. Comfort Products develops, manufacturers, and markets targeted consumer products designed to improve and enhance the lives of consumers in a variety of applications. As the name implies, they put the “comfort” into daily life. With an emphasis on automotive, seating, and wellness products, Comfort Products has a long history dating back to 1919. For decades, the company has been a trailblazer in their product categories, and established long-standing relationships with their customers with loyal brand name followings such as Kool Kooshion, Relaxzen. Headquartered in Memphis, TN, America’s distribution capital, the company has distribution facilities in Olive Branch, MS and Mesquite, TX, and permanent offices in Asia. Their long company history and strategic business partners allow them to provide quality products at tremendous values. Enjoy a relaxing massage with the Comfort Products Stress-Reducing Massage Chair. The black, soft bonded leather upholstery with matching vinyl zones and a seating area of 19″ x 18″ combine for a comfortable task chair. This chair features molded PP arms and a nylon base. This massage chair has pneumatic lift height adjustment and swivel features and requires 4 AA batteries (not included) to power the two vibration massage motors that relax the back. This chair meets or exceeds BIFMA standards and has a weight capacity of 225 pounds. Comfort Products develops, manufacturers, and markets targeted consumer products designed to improve and enhance the lives of consumers in a variety of applications. As the name implies, they put the “comfort” into daily life. With an emphasis on automotive, seating, and wellness products, Comfort Products has a long history dating back to 1919. For decades, the company has been a trailblazer in their product categories, and established long-standing relationships with their customers with loyal brand name followings such as Kool Kooshion, Relaxzen. Headquartered in Memphis, TN, America’s distribution capital, the company has distribution facilities in Olive Branch, MS and Mesquite, TX, and permanent offices in Asia. Their long company history and strategic business partners allow them to provide quality products at tremendous values. 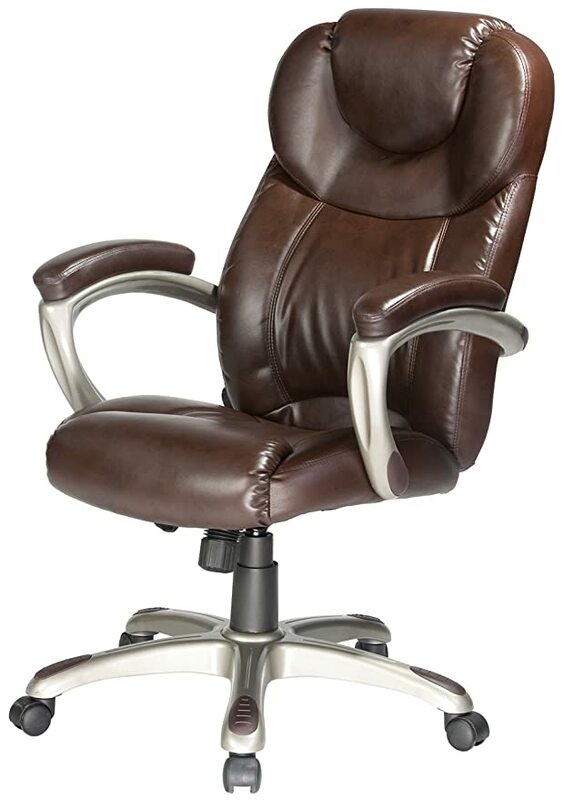 The Granton leather executive chair with adjustable lumbar support by Comfort Products features mocha brown leather, molded arms and base with color finish and standard tilt, tilt tension, lock, seat height adjustment. Comfort Products develops, manufacturers, and markets targeted consumer products designed to improve and enhance the lives of consumers in a variety of applications. As the name implies, they put the “comfort” into daily life. With an emphasis on automotive, seating, and wellness products, Comfort Products has a long history dating back to 1919. For decades, the company has been a trailblazer in their product categories, and established long-standing relationships with their customers with loyal brand name followings such as Kool Kooshion, Relaxzen. Headquartered in Memphis, TN, America’s distribution capital, the company has distribution facilities in Olive Branch, MS and Mesquite, TX, and permanent offices in Asia. Their long company history and strategic business partners allow them to provide quality products at tremendous values. With a sleek, simple and straightforward design, the multi-purpose and ergonomic Comfort Products PU Mid-Back Office Chair is an ideal choice for home or office. The easy-to-assemble chair is constructed of a nylon base and frame with bonded leather upholstered foam padded seating. Pneumatic seat height adjust lowers and raises the chair as needed while the swivel feature increases maneuverability while sitting. The chair is supported by a thick and durable nylon base with dual wheel casters that roll easily on most surfaces such as chair mats, linoleum and short pile carpet. 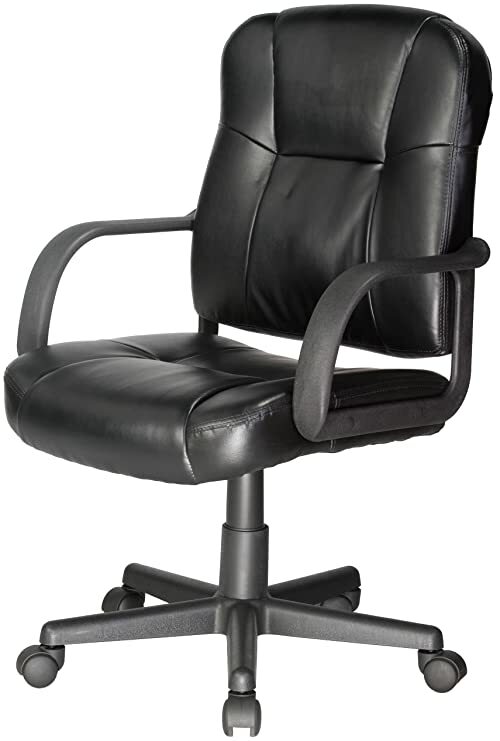 This chair meets or exceeds all BIFMA requirements and supports up to 225 lbs. This assembly-required chair is packaged individually. Enjoy a relaxing massage with the Comfort Products Stress-Reducing Massage Chair. The brown, soft bonded leather upholstery with matching vinyl zones and a seating area of 19″ x 18″ combine for a comfortable task chair. This chair features molded PP arms and a nylon base. This massage chair has pneumatic lift height adjustment and swivel features and requires 4 AA batteries (not included) to power the two vibration massage motors that relax the back. This chair meets or exceeds BIFMA standards and has a weight capacity of 225 pounds. Comfort Products develops, manufacturers, and markets targeted consumer products designed to improve and enhance the lives of consumers in a variety of applications. As the name implies, they put the “comfort” into daily life. With an emphasis on automotive, seating, and wellness products, Comfort Products has a long history dating back to 1919. For decades, the company has been a trailblazer in their product categories, and established long-standing relationships with their customers with loyal brand name followings such as Kool Kooshion, Relaxzen. Headquartered in Memphis, TN, America’s distribution capital, the company has distribution facilities in Olive Branch, MS and Mesquite, TX, and permanent offices in Asia. Their long company history and strategic business partners allow them to provide quality products at tremendous values. The Coublo Collection by Comfort Products, Inc. embodies style, function, durability and purpose while providing furniture that demands attention and functions as a staple to the home or office. With an eye-grabbing contemporary style, the Coublo Console is sure to add style to any room. Interchangeable door inserts allows the user to quickly change the doors to either glass or wooden fronts as often as wanted. With overall dimensions of 39.25″W x 18.25″D x 30″H, the cabinet is great for the home, office or dorm room. Two 16.25″W x 27.25″D storage areas provide enough room for cable boxes, DVD players, DVDs, books, or whatever else needs to be stored. Two adjustable shelves per side allow adjustment from 6.5″ from the bottom up to 21.5″. When using the wooden inserts, use the console as office storage for reams of paper, files, or whatever else needs to be stashed out of sight. Made with a mix of engineered wood and a thick PU laminate to protect against scratches, the Coublo Console is BIFMA SOHO Approved. With a sleek, simple and elegant contrast stitching, the multipurpose bonded leather mid-back office chair is an ideal choice for a home office, dorm room or children’s room. The ergonomically designed chair promotes comfort with a built-in lumbar support region and molded permanent armrests that provide stability and help to reduce strain on shoulders while working for an extended period. With an overall seating area of 18 x 18 inches and 3 inches of padding in the seat, this mid-size chair will provide long lasting comfort. Leather provides a strong and durable surface and requires only a damp cloth to clean. Pneumatic seat Height adjust provides the ability to lower and raise the chair as needed while the swivel feature promotes maneuverability while sitting. Durability is a key component to the chair and it is supported by a thick and durable nylon base with dual wheel casters which roll easily on most surfaces such as chair mats, linoleum, and short pile carpet. This chair meets or exceeds all BIFMA requirements and will support up to 250 lbs. 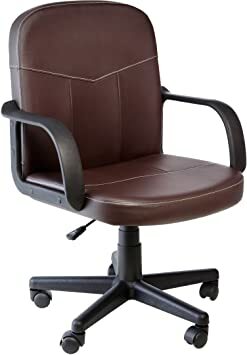 The 60-5811 Highback, twin-cushion, bonded leather executive chair by Comfort Products features an outstanding design for the price. Black bonded leather with vinyl match and contrast stitch design. Molded padded arms with contoured nylon base. Tilt, tilt tension, swivel, tilt lock, seat height adjustment. Comfort Products develops, manufacturers, and markets targeted consumer products designed to improve and enhance the lives of consumers in a variety of applications. As the name implies, they put the “comfort” into daily life. With an emphasis on automotive, seating, and wellness products, Comfort Products has a long history dating back to 1919. For decades, the company has been a trailblazer in their product categories, and established long-standing relationships with their customers with loyal brand name followings such as Kool Kooshion, Relaxzen. Headquartered in Memphis, TN, America’s distribution capital, the company has distribution facilities in Olive Branch, MS and Mesquite, TX, and permanent offices in Asia. Their long company history and strategic business partners allow them to provide quality products at tremendous values.